CMB is one those very rare and refreshing Trio projects that catches your attention right away. Not only because of the intense interaction and energy between those three great musicians, but also because of the beautiful songs composed by Stefan Michalke (Piano), Stefan Berger (Bass) and Christine Corvisier (T.Sax). Starting from Jazz, but going through World, Pop, Classical Music and a detour on Tango, CMB Trio offers you a fantastic journey of Music. Christine Corvisier and Spyros Manesis (Piano) met in Amsterdam in 2006 but started their duo some years after during a tour in Val d’Isere (France). They started composing a special repertoire for this setting to allow the duo gainning in creativity, intensity and virtuosity. They quickly started to perform on beautiful international scenes like Vive le Jazz Festival (Köln, D), Domicil (Dortmund, D), Ionian Center (Athens, Gr), Beton 7 (Athens, Gr). The duo is about to release their 1st album „First Takes“ recorded during their last tour in Greece in February 2015. „Back to the roots“: that’s the motto of this band led by the great piano player Gero Körner. Indeed the 4tet presents a repertoire from the 50’s and the 60’s going from Boogaloo till Wayne Shorter that’s very much enjoyable as much for jazz listenners as for people without any knowledge of jazz music. The band just recorded a demo and is especially performing in North Rhine Westphalia where they’re based. 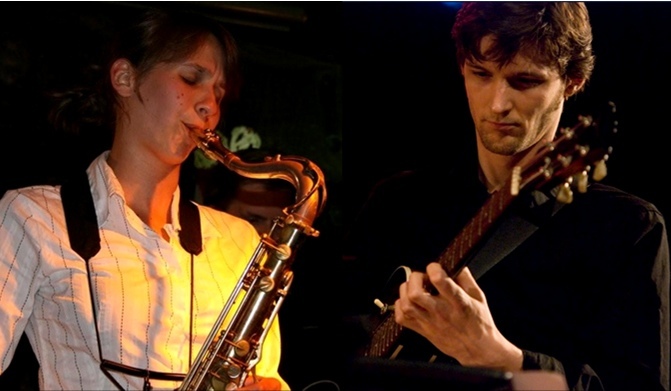 Husband and wife, Christine Corvisier and Philipp Brämswig (Guitar) also keep on sharing the love of Jazz Music and are regularly performing in duo a repertoire mostly of Jazz Standards.